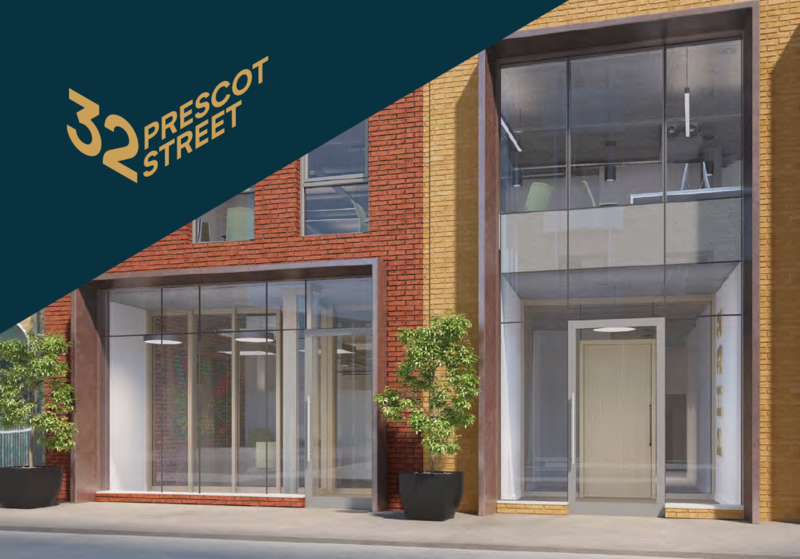 32 Prescot Street is a brand new 8,163 sq. ft. development arranged over three floors in the heart of the vibrant E1 district. Prescott Street is located in E1, minutes away from Tower Hill and the City of London and is one of the fastest growing hubs in central London. Significant investment in the last few years has seen a the erection of new office developments, residential schemes, public space, hotels and a wide range of independent food, retail and leisure amenities. The area will further benefit from Crossrail which is due to launch this year, with the line running through Whitechapel and Liverpool Street stations. Due for completion in January 2019, the self contained offices will be finished to a high standard and provide open plan workspace. Each of the offices will include comfort cooling and heating, fibre optic lines, CAT 6 cabling, raised access floor with solid timber walnut floor boards and fitted kitchens. Two private terraces can be accessed from the first and lower ground floors. To request more information about this office space, please click here.